« Homepage / Food and Healthy Eating / Recipes / "Cedar Plank Fish"
Soak the cedar planks in water for at least an hour beforehand. Preheat the grill. Brush the plank with olive oil. Season the fish on both sides with Creole seasoning. Lay the fish in the center of the plank. Cut the tomato in half, lay it on its side, and cut into thin slices. Lay the tomatoes shingle style over the fish. Set the plank in the center of the grill and cover immediately. Cook for about 15 minutes or until the fish is cooked and flaky. There will be a lot of smoke but this is from the plank smoldering. 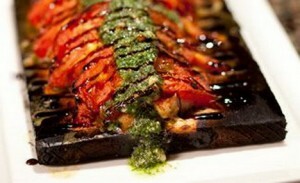 Serve the plank on a plate and drizzle with pesto and balsamic syrup. Alternatively, place the prepared plank, not soaked in water but brushed with olive oil, topped with the seasoned fish and tomatoes in a 500 degree oven for ten minutes. Finish under the broiler until the wood is smoldering. Serve on the board with a line of pesto over the tomatoes and drizzle with balsamic syrup. In a small saucepan blanch the basil and parsley in boiling, salted water for 10 seconds. Remove from water and place in an ice bath to stop cooking. Drain and pat dry on paper towels. In the bowl of a food processor, combine the basil, cheese, pine nuts, garlic, salt and pepper. Puree on high speed. Slowly add the oil through the feed tube and process until a smooth paste forms. Pour into a bowl until ready to use. Here you can write a comment to the post "Cedar Plank Fish"